Recognizing the importance of information security management, and in compliance with the All Toyota Security Guidelines (ATSG), we have established internal structures, provided employees with information and education on rules and regulations, and conduct inspections and so on. The Risk Management Department conducts security inspections to ensure that there are no issues with external email, that employees do not carelessly take internal information outside the office, or that USB memory, cameras, and other devices are handled properly. 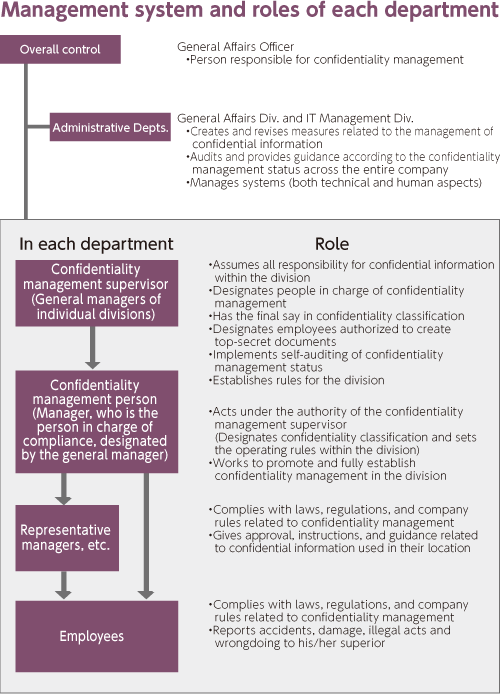 Along with enhanced checking functionality in the system, including the adoption of a system of alerts to persons in charge of confidentiality management in each department in the event of unauthorized access to confidential information, we are further enhancing our confidentiality management structure to also provide advice from experts. We have applied the ATSGs at all Group companies, and are enhancing information security across the entire Aichi Steel Group. We, for security controls and to prevent leakages of personal information, have established rules regarding the procedures for handling documents and data, sending and receipt of email, and management standards and procedures for computers and peripheral devices. Private information protection rules, etc. We carefully handle and strictly control any information held by the Company or by any Group company, and any information obtained from our customers, suppliers or employees, etc., in accordance with our internal rules. All information, products, and facilities, regardless of form, designated as subject to restrictions on disclosure by the confidentiality management supervisor specified under the information security system. Confidential information regarding other companies obtained through proper means is also included. Through our CSR meetings, management receives updates on current Group information security management levels, as well as issues and ongoing efforts, ensuring a common awareness of information security as a management issue. For employees, a check is conducted using an "information security checklist" for every employee using a personal computer in their day-to-day work, regarding handling of information devices and various related rules. Based on those results, staff responsible for education in each department, along with department heads, provide individual instruction. We also present public incidents of information leaks in a news format, and issue company-wide alerts when a computer virus or other malicious program is discovered in the Company, in order to raise awareness of security controls.